Precious, right?! I love each and every one of Lisa Leanord's jewelry designs. This beautiful momma of two boys hand makes each of the pieces you find in her shop. There is something so special about giving and receiving a personalized piece. Lisa is generously offering an IHOD reader a 75$ gift certificate! Use it for yourself, or as a Mother's day gift! This includes all you lovely email subscribers and bloglovin followers! 1) Visit Lisa Leonard Designs, and let us know what you would use the gift certificate for! 4) Sign up for Lisa's newsletter on the website. Open to U.S. and Canada! Winner will be announced next Tuesday! Best of luck! itty bitty heart necklace!! Very cute! What a great giveaway! I follow Lisa on twitter! I also now follow her on twitter! And signed up for her newsletter! it's a toss up between the from up here necklace and the keepsake bowl. CUTE stuff!! I loooooooove the sweetheart tree necklace! So cute! I love the heartstings necklace, and the bowl, and the keychain, and.........well, all of her items! Wonderful wedding gifts! I'd definitely use this to get my mom a sweet necklace or a keychain, since she always uses such big purses that her keys get lost in them! And I'm following Lisa on Twitter! I would get the keepsake bowl! yay to another wonderful giveaway!! key to my heart necklace' is pretty awesome. :) thx. All of Lisa's designs are so pretty; it's hard to choose what I'd use the gift certificate for -- But, I think I'd have to go with putting it towards the Banner Bracelet. I'd have it personalized with my husband and daughter's names. Great giveaway, Anna, and thank you to Lisa! I LOVE the Whoo Do You Love necklace!! I love the banner necklace! It's so sweet. I love the family tree necklace or the from up here necklace. I follow Lisa in twitter. I get Lisa's newsletter to. I love all her necklaces! I'd have a hard time choosing! Thanks for the giveaway! 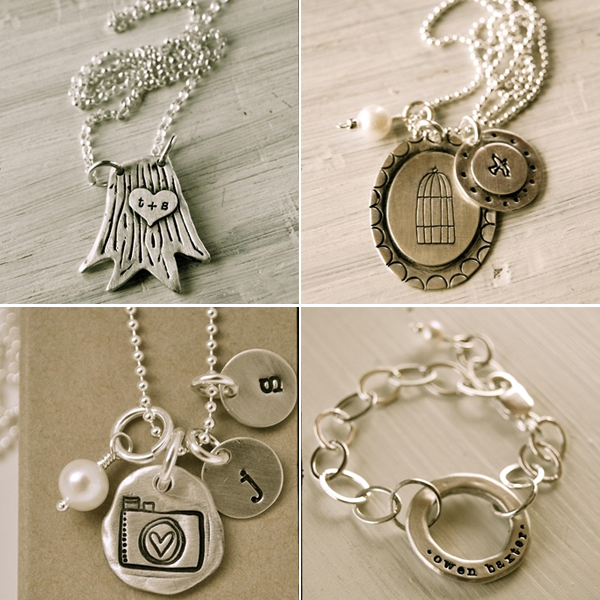 I love the through my lens and teenie tiny initials necklaces. I LOVE the Large Initials necklace! Signed up for Lisa's newsletter! Shared with my Facebook friends! YAY! I've seen this shop before and I really want a tree trunk necklace with initials. I think they are so sweet! Fingers crossed! Tell you want I would get with the gift card. Check. Tweet about the giveaway. Check. I love the cream in my coffee necklace and the hope is the thing with feathers necklace. I subscribe to her newsletter. I love the "fly free" necklace! I already "follow" Lisa on Twitter! I just "tweeted" about the giveaway! I would use the gift certificate for either the key to my heart necklace or the sweetheart tree necklace. All of her necklaces are so beautiful though! I love the idea of having a piece of jewelry that represents my family. It's a toss-up between...at least three designs. :) But I really love the simplicity of "teeny tiny initials." I signed up for her newsletter as well. I'm following Lisa on twitter. And I'm signed up for the newsletter! Thanks for hosting this giveaway! 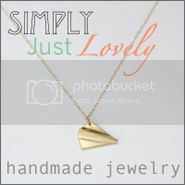 the BE STILL necklace! LOVE IT! Amazing giveaway! Lisa is so precious and so talented! I already follow Lisa on Twitter. I already signed up for Lisa's email list! Thanks Anna for doing this giveaway! I think I would choose the "Thru my lens" necklace, but I want sooo many! I follow Lisa on FB, Twitter, & get her email updates! just read your precious birth story. the pictures are beautiful. i follow lisa on twitter. I love her sterling ring! I signed up for lisa's newsletter! I'm now a follower... cute stuff! I would pick the 'hope is the thing' necklace... luv that one. great giveaway!!! i want to get my mother-in-law a birthday present from LL designs but can't afford it at this time! i'd LOVE to win to get her something!!! i would buy her the heartstrings necklace and personalize it with her grand babies names on it! signed up for her newsletter! I would get several pairs of her beautiful earrings. Like the Crystal drop earrings, Cream Freshwater Pearl earrings and Aqua Stone earrings. I like the molded heart necklace! I'd love to win so I can buy my friend a really nice wedding present! I've got my eye on the pewter heart wall hanging. So cute! I love the molded heart bracelet! What a fantastic giveaway! I would get the thin sterling cuff for my mother! She would love it! I am following Lisa on twitter! I love the pennant banner! i just bought the darling little wand for my daughter! too cute! I love the "faith, hope, love" necklace. i signed up for her newsletter! thanks for hosting such a great giveaway! So much good stuff! I would love the "teenie tiny inititals" necklace or the "grow roots sprout wings" necklace. Beautiful! i want to get something for my 5 bestie friends before i move away. 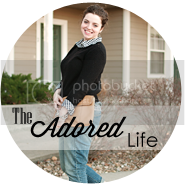 I love the lovebird wall hanging! SO perfect for my little girls room. I would get the paper lantern necklace. I am already a follower of course!! I love the Little Lady necklace. It would be perfect for my little girl, Adelaide. I adore the "from up here" necklace. So cute! What an awesome giveaway! Thanks so much! so hard to choose just one thing! I would choose the keepsake bowl. I'm getting married next year, and I think that would make an adorable ring bowl! 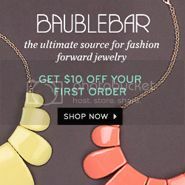 Lisa, I love all your jewelery, your photos & your blog - keep it up! I also get the newsletter! So many great choices, but I think I'd pick the connect and create bracelet. Love it! I follow Lisa on Twitter :). ... and I get her newsletter. Anna those are adorable, please count me in! My favorite piece? The Fly Free NEcklace - how cute is that?? Oh I hope I win, wish me luck! 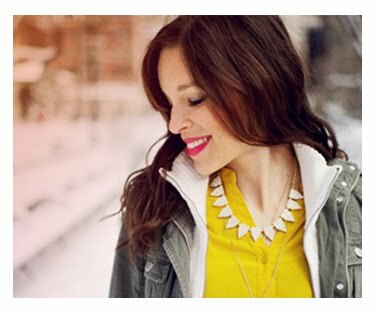 I'd love a Through my lens necklace to celebrate my new photography business! Great contest! Basic rectangle necklace is my pick! first time here & new subscriber. i've been loving her decor line. i'd like some of the magnets or a banner. I would love to own the tiny squares necklace! I've been coveting the Family Crest necklace for some time now, so I would definitely buy that! I would get the fly free necklace! I really like the forever necklace!! I love the Molded Heart Necklace! I follow Lisa Leonard Designs on Twitter. I am already signed up for her e-mail newsletter. I adore the molded heart bracelet! I love the personalized necklace, she has a picture of one that says 'grace' on it and that's what I would get! :) thanks for the giveaway! I love the silver leaf earrings and ornament! stoked about this awesome giveaway! thank you to both you ladies for offering it up to us all! just have to say the folks who did the web design for Lisa's site really created a special space to showcase her wares. i love the frames around her jewelry and the modern/vintage, whimsy vibe going on over there. Love all these gorgeous pieces....count me in! too many goodies to choose from, I can't decide! Love the Vintage Frames Necklace. I follow Lisa on Twitter via @bbgoad. I'd like a simple initial on a chain necklace. I would love to have one of her new pewter keepsake bowls! I have had my eye on the Key to My Heart necklace for a long time now! I would use the gc towards that. I'm signed up for Lisa's newsletter. this is such a great giveaway! i love that "key to my heart" necklace!